Venosta Valley is long and varied and therefore ideal for exploring by bicycle. The tours along the bottom of the valley are optimal for moderate cyclists and families. More ambitious cyclists can find challenging destinations for race cycling and mountain biking on the pass-roads and at the mountainsides. The 80km long Adige cycling trail along the old Roman road the Via Claudia Augusta is particularly popular among moderate cyclists. The way runs from Resia Lake in the North to the spa town of Merano/Meran. It runs through Burgusio/Burgeis with a view of the Marienberg Abbey, through Malles/Mals with its five Romanesque churches, through the medieval town of Glorenza/Glurns and also past the ancient St. Proculus church in Naturno/Naturns with its pre-Carolingian frescos. One of the most exciting cycling routes in Venosta Valley leads up to the 2,760 m high Stelvio Pass, one of the highest mountain passes in the Alps. The Stelvio Pass road with its 48 bends is also one of the most important stages of the Giro d'Italia race. The entire Venosta Valley with its numerous cycle routes is of course also accessible to e-bike and e-mountain bike fans. The environmentally friendly bicycles with electronic drive support are offered for hire in numerous hotels and bike shops in the Venosta Valley. A total of seven railway stations located along the Venosta Valley Adige Cycle Route form part of the "Südtirol Rad" network, with cycle rental services for both adults and children. Cycles can be collected and returned to any of the seven stations. The bikemobil Card provides a relaxed cycling holiday. This combination ticket allows the easy use of all public transport across all of South Tyrol along with the rental of a bicycle at one of many participating stations. With our package tour "From the springs of the Adige river to the Caldaro Lake" expect an adventurous weekend by bicycle along the Adige river. 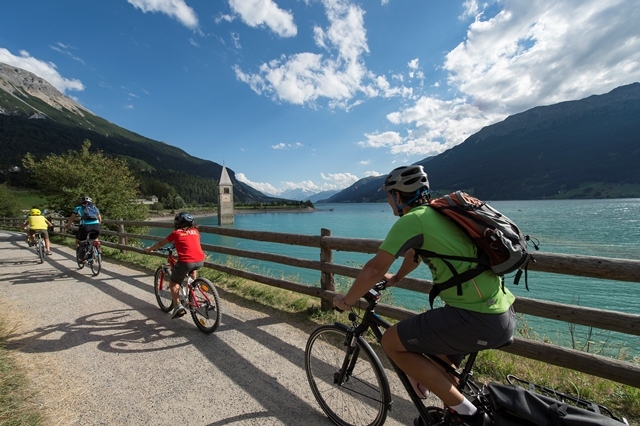 The cycling route leads from the Resia Lake at the triple border with Austria and Switzerland all the way down to the more Mediterranean wine-growing region at the Caldaro Lake. At the E-Bike Testival in Laces/Latsch, participants can expect a comprehensive four-day program suitable for all visitors. In addition to information about E-Road, E-Trekking and E-Mountainbikes, learn all about the latest innovations and the new E-Bike trend! At the hugely popular Stelvio Bike Day, the spectacular panoramic Stelvio Pass road provides the stage for a race of hundreds of bicycle fans on wheels, heading up to the Stelvio Pass at a height of 2,758 m. On this famous stage of the Giro d'Italia, there are a total of 1,869 heights and 48 bends to be overcome. The participating cyclists are rewarded with breathtaking panoramic views of the mountains. 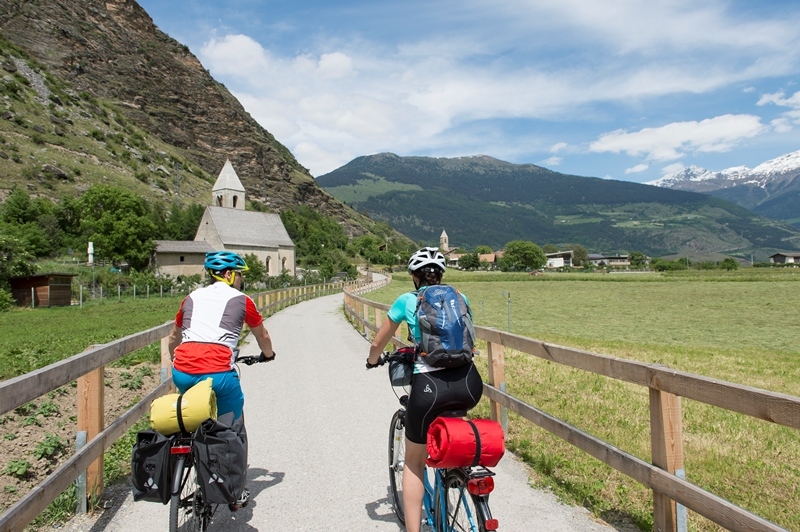 Augustour is the name of a multi-day cycling tour (Italian Green Road Awards 2015), which leads through South Tyrol and Trentino in three stages. All participants, including families, clubs and teams, with touring cycles, mountain bikes, road bicycles or e-bikes, are welcome to discover the beauty of nature and culture along the old Roman road, the Via Claudia Augusta. Take advantage of the Venosta Valley Bikeshuttle service, which also includes bicycle transport. It brings cyclists to the requested starting point of a biking tour and then picks them up again at the requested destination. With the VenostaCard (available free of charge at partaking hotels), you can also make use of the service at reduced rates.